Bernard Cribbins' short but significant career as a pop singer grew from a partnership he forged with two songwriters that he had become acquainted with in a revue called "....and another thing". It was in this revue that he had to learn a song called "Folk Song" a very funny ditty which became his first outing on record (The B-side included another member from the same revue- Joyce Blair). Although the "Folk Song" never quite managed to break into the sales chart, it was popular and led the trio to try again with another in the same comic vein. The result was so successful that it set off Bernard on a new thread to his professional career and suddenly brought him fame hitherto he'd only imagined. The little sequence of hits enjoyed by Bernard really lasted only a year, but many of us able to think back to it with fond memories will no doubt believe it to have been much longer. 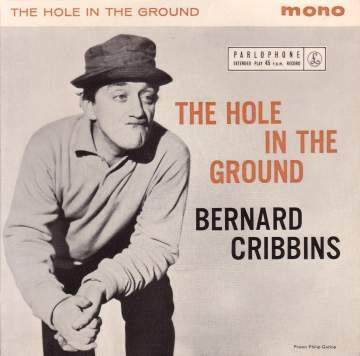 The EP illustrated here was released while Bernard Cribbins was at the height of his singing fame. It contained his first smash hit "Hole In The Ground" together with his original comic output, "Folk Song". All of the songs featured, like all his most successful musical output were written by songwriters, Ted Dicks and Myles Rudge -the latter of whom wrote the sleeve notes. Bernard's second hit is possibly even better known than his first and its title was even taken as its name by a 1990s UK rock group. However, the songwriting partnership presumably began to run out of ideas because Bernard's final chart success was another comedy piece written by Trevor Peacock. Although Bernard Cribbins musical career was largely at its end, he became a much revered actor and performer during the 1960s and appeared in many movies, both comedy and serious. He also became a well known children's performer and will be familar to many as the narrator of the successful TV series, "The Wombles". At the time of writing, despite the passing of the years, Bernard Cribbins is still going strong. Parlophone GEP8859 1956 "The Hole In The Ground"